Simple, sweet, and totally indulgent, these figs will be the talk of your party… even though they will be the easiest appetizer to make! Pungent robiola cheese can be substituted with brie, ricotta, or any other soft cheese in this simple no-cook appetizer. Working from the stem end of each fig and using a paring knife, cut an “x”, about halfway toward the base; set aside. Mix robiola, honey, salt and pepper in a bowl. Spoon filling into a piping bag with a plain 1⁄2″ tip; pipe about 1 teaspoon into each fig. Garnish with pomegranate seeds and dill sprigs and serve. Hanukkah, a festival commemorating deliverance from religious oppression and the re-dedication of the Holy Temple in Jerusalem, is a beloved Jewish holiday. Traditional Hanukkah dishes ring in the Festival of Lights with family favorites like braised brisket, crispy latkes, fresh doughnuts and a roast chicken dinner. This dish has a complex of sweet, spicy and tart flavors that will excite your taste buds and leave your guest wanting more. Quarter the lemon lengthwise, removing any seeds. Thinly slice crosswise into small wedges and add to small pot of boiling, salted water. Blanch for two minutes and drain. Reserve the lemon wedges. In a saucepan, whisk together lemon juice, orange juice, oil, mustard, honey, salt, bay leaf, red pepper flakes and black pepper to taste. Bring to a boil and simmer for five minutes. Let cool. Put chicken in a bowl and add honey mixture. Add carrots, onion, dates, thyme and blanched lemon slices. Turn mixture several times to coat. Let marinate for at least 30 minutes at room temperature, or overnight for in the refrigerator, for best results. Heat oven to 425 degrees. Transfer all ingredients, including marinade, to a sheet pan with a rim or a glass baking dish. Chicken should be skin side up. Roast until chicken is browned and cooked through, about 20 to 30 minutes for breasts and 30 to 40 for legs and wings. Mix the marmalade and vinegar together and brush over the chicken. Roast for an additional 5 minutes to set the glaze. Let the chicken rest for 30 minutes. Deglaze the pan with white wine and scrape the browned bits from the bottom of the pan. Add the carrots to the pan and stir; if the bottom of the pan still looks, dry add 2 to 3 tablespoons water. Continue roasting the carrots until they are tender, about seven to 12 minutes longer. 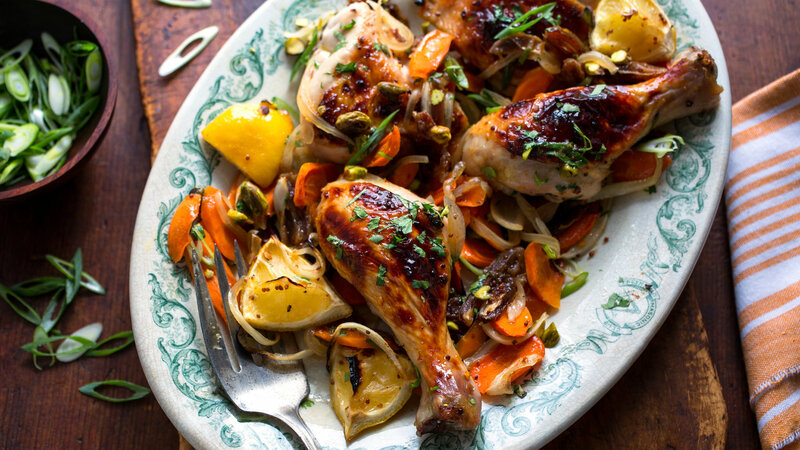 To serve family style, arrange the pieces chicken on a large platter.Spoon carrots over chicken and top with parsley, scallions and a sprinkling of pine nuts.